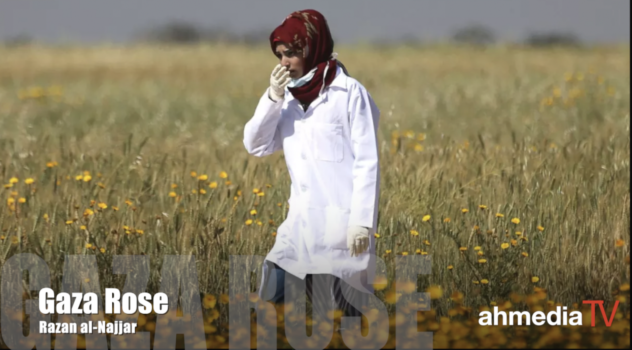 Gaza Rose, Razan al-Najjar | Notes From America ! The Palestinian ‘Great March of Return‘, protested Nakba Day, better known in the west as Israeli Independence Day, a peaceful protest symbolically demanding the right of return to their homeland taken by force in the establishment of the Jewish state in 1948. In a few weeks of protests, the Israeli forces killed around 120 Palestinians and injured thousands more, mostly by snipers. Razan al-Najjar, a Palestinian medic, every morning assured her mum not to worry, that god was protecting her, but she wore a protective vest in case. “My daughter would be out every Friday between 7am and 8pm. She was in the field doing her work, healing the wounds of the injured, and was a brave paramedic who was never scared of the Israeli snipers,” Najjar’s mother said. Razan al-Najjar,the eldest of six brothers and sisters, loved her job. She got her nursing diploma and was eager to help and save innocent lives. On Friday June 1st, she was busy that day on the killing field, people falling everywhere, the Israeli soldiers shooting at protestors with impunity. Najjar rushed closer to the fence between Israel and Gaza, in a video you can see the 21 year old paramedic with her white dress, waving her hands to alert Israeli soldiers on the other side of the fence that she is a paramedic and was only trying to help injured people. An Israeli sniper looked through the fence, saw Ms Najjar, aimed, thought, and shot her. Razan al-Najjar died of her wounds a few hours later. “Here is her weapon! 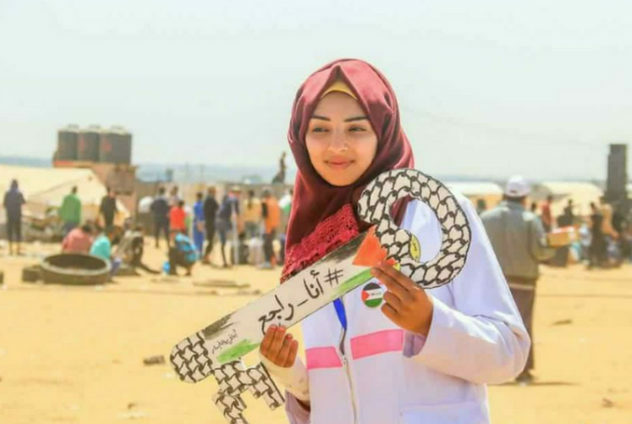 I want the world to know this is the weapon of Razan al-Najjar – is this the ID of a terrorist?” Nazar al-Najjar’s mother sadly asked while holding up her daughter’s medical ID she wore at the time of her death. Najjar’s story violated the self-righteous Western script. However, unlike Malala, her story upholds this narrative; a young oppressed Muslim woman shot by a Muslim jihadist for defending women’s rights in a backward Muslim world. Najjar was just doing her job, trying to save the lives of Palestinians who had been demonized and marginalized for years. Najjar wasn’t as lucky, she wasn’t a victim of foes, a victim of the Taliban; she didn’t fit the narrative of a Muslim woman oppressed by Muslim extremists but was instead killed by Jewish extremists. For the American media, Palestinians just die, they aren’t killed. The New York Times decried Najjar’s killing with a headline that showed a mysteriously killing that exonerated the killer, “A Woman dedicated to saving lives loses hers in Gaza Violence.” How she lost her life is open for debate and the killing of more than 100 people in a few days is described as “Gaza Violence.” The Wall Street Journaldescribed the massacre as “Clashes” between the Israelis and Palestinians. The number of Israelis killed was zero whereas the number of Palestinians killed so far is 120 and on the rise every day. Israeli weapons are tanks, F16’s, machine guns. Palestinians are armed with rocks, slingshots, kites, white gowns and medic IDs.